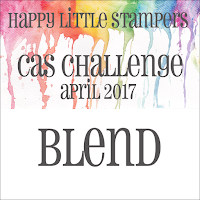 Time for our new 'Clean and Simple' challenge at Happy Little Stampers. If you are not sure what 'Clean and Simple' means in the crafting world-check out the explanation on our blog here. Blending is something I find hard and am not so keen on it but I gave it a go and I am o.k with the result, although not my favourite card! The sentiment is from Happy Little Stampers-Mix Mash set. I did a little stamp surgery so I could just use the 'Birthday'. I have blended some brushos onto water colour card and attached this behind the window. Then just used a die cut the sentiment over this. I think this is a card that could be used for both men and women. Check out what the DT have made to inspire you here and then get blending! 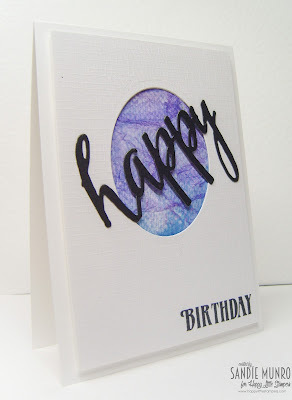 Gorgeous card...your blending is fabulous! I'm with Nonni and think your blending looks great. Love the mix of blues and purples. I love the colors you used. Great central catching point. Beautiful CAS card! You should be happy with the result, this is a beautiful card with a great design!